Last month I was asked to write a column for The Roving Report, From The Top’s monthly newsletter, about Violinist.com member Lindsay Deutsch, who is one of From The Top’s original alums, from its first season back in 1999. My column had a very strict 500-word limit, which was a shame because Lindsay had so many interesting points about her musical life and her educational projects. So I thought I’d post the expanded version of that brief interview here. 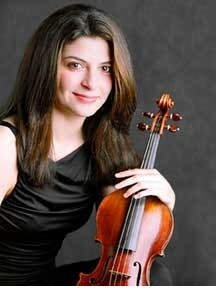 Long-time readers may remember that Lindsay first came to light on Violinist.com in 2005, when her 1742 Sanctus Seraphin violin, on loan to her from the Mandell Collection, was stolen from her car during a ten-minute stop in a grocery store. Fortunately, the instrument was soon recovered, unharmed. Since then, Lindsay has gone on to distinguish herself as a soloist and chamber musician, has been featured in an article in The Strad magazine, and has even played on the sound track of Robert DiNiro’s 2006 movie The Good Shepherd. In 2007, she and her sister, violinist Lauren Deutsch, co-founded a nonprofit organization, Classics Alive, which offers master classes, mentoring and an interactive website designed to get young kids involved with classical music. She is also starting up an instrumental loan program for kids who can’t afford instruments and creating a series of instructional DVDs. Caeli: There is a paragraph on your website that explains that you feel strongly that young people need to be exposed to the world of classical music. I couldn't agree more! Lindsay: As a child growing up in Texas, there were many wonderful programs in our community which made their mission to get young people involved in classical music. The public elementary school I went to actually had a program which started kids off on different instruments and provided the instruments and classes free of charge. Only a year after I began violin lessons, I heard of a program called Houston Young Artists Concert which really gave me the performing bug. I auditioned when I was six, and was invited to give my debut in a televised concert at the University of Houston Moores School of Music. It was after this experience that I knew performing is what I am most passionate about and that this would be my goal in life. Because experiences like these had such a huge impact on my life, and because these types of programs seem to be disappearing, my family and I decided to do something to give back, and our organization Classics Alive was the perfect way for us to do it. Caeli: How does your mentoring system work? Lindsay: Right now, Classics Alive does involves master classes for music students, going into classrooms to play for kids to expose them to joy of classical music, and our interactive web page especially designed for kids. The web site offers contests and games for students to test their musical knowledge. We give out prizes to the winners of the "Cryptic Composer Contest" and we are in the midst of creating a contest where students would send in a video of their playing, we will put it on-line, and the public will vote for their favorite. Kind of like American Idol. We are expanding our programs to include an Instrument Loan Program for students who can't afford to buy an instrument. (For an application, go to www.classicsalive.org.) I was fortunate enough to be loaned an instrument from the Mandell Collection of Southern California, so I understand what a huge impact having an inspiring instrument can have. Caeli: I noticed you have a “Student of the Month” award. How does that work? Caeli: What have you been up to musically? Lindsay: Right now, I am busiest performing as soloist with orchestra. Caeli: Do you prefer being soloist with an orchestra, as opposed to, say, playing in a chamber group? Lindsay:There is something so exhilarating about performing in front of a massive group of musicians and I just can't get enough of it. Often during tuttis, I find myself so overwhelmed by the sheer power of the orchestra only a few feet behind me that I get goose bumps. Luckily, most of the time, I remember that tuttis don't last forever, and that I will be expected to come back in at some point! Even though the orchestra is a big machine, it is still possible, and I think necessary, to view concertos with orchestra as chamber music. I love to communicate with individual members of the orchestra onstage if they have a particularly important line and I think it makes for better music making and a more enjoyable time for the audience. As far as real chamber music, I've gotten to work with some really first rate artists at different festivals such as Jeffrey Kahane's Green Music Festival in Sonoma and Jimmy Lin's Summerfest in La Jolla . Caeli: What’s your favorite thing about chamber music? Linsday: This may sound bizarre, but one of the most exciting things about playing in these kinds of festivals is the lack of rehearsal time. There is something really thrilling about going onstage without having every little detail exactly planned. There is so much room for real musical inspiration, and I know the audience can feel that and really appreciates it when it works. When it doesn't work, of course, you just confiscate all video and audio recordings! Caeli: You moved to Los Angeles as a young teenager, specifically to study violin. Lindsay: Yes, I've been at the Colburn School for nine years now. My family actually moved from Houston so I could study with Robert Lipsett. I started in the high school program when the conservatory program didn't even exist. When I was a senior in high school, my teacher told me the exciting news about the new, free conservatory and it sounded like a pretty good deal to me – and perfect timing too! I'm working on completing the Performance Diploma program which is an alternative to the Bachelor degree for students who are busy with performance engagements. I feel so lucky to live (quite literally) at the center of musical life in downtown LA. Disney Hall is right across the street, and it is not rare to see superstars like Itzhak Perlman and Yo-Yo Ma roaming around the neighborhood. Caeli: Tell me about your appearance on From The Top’s first season. Not to put words in your mouth, but did being on From The Top help to jump-start your passion for bringing classical music to people in new ways? Lindsay: From The Top brings back such special memories. I was on the show with Joshua Bell and Edgar Meyer and found them to be really down to earth, unassuming guys. They sincerely love what they're doing so much, that they give the impression they'd be just as happy playing their instruments on the side of the road as they are in Carnegie Hall. It made me feel pretty lucky that I, too, had found my real passion in life. Also, the relaxed atmosphere of the show, and the little comedic interludes worked so well with the audience, it made me see my role as a classical performer in a wider scope. I realized that by talking to the audience and even joking with them, in between pieces, I had a better chance of connecting with them and of making the whole process more enjoyable. Since performing on the show I've seen Chris O'Riley perform several times and he seems to really have this idea down to a science. Caeli: Your sister Lauren, who co-founded Classics Alive, is also a violinist; what was it like growing up in a musical family? How has it been working together with her on this? Lindsay: Every member of my family plays an instrument, in fact, everyone but me plays multiple instruments. This made for a very noisy, very entertaining childhood! The only time problems arose was when someone suddenly thought themselves an expert on another's instrument and got overly brave with "helpful hints". Caeli: I have three sisters, all musicians, so I can definitely relate! Lindsay: Once we all learned to keep our hints to ourselves, we got along quite nicely. In fact, my sister Lauren and I co-founded the Classics Alive Foundation. We come at it from very different perspectives, which I think has been positive for the organization. Lauren is a fantastic teacher and works with a lot of young kids. Because she has spent years learning what makes kids excited about music, she has been instrumental in shaping our hands on kids programs in ways that make them really want to participate in and stay in classical music. Enjoyed reading this! Thanks Caeli, thanks Lindsay.